Would you like to pay respects to Formula One legend Ayrton Senna with your mustard? Products branded with Senna’s name and likeness can be found in a lot of places in Brazil, and as is fitting with his life of charitable giving, they still fund educational programs for Brazilian kids. Senna’s name is still so popular that it’s made its way onto everything from shirts and action figures all the way to more unexpected items, like foodstuffs. Senna died in a crash at the F1 San Marino Grand Prix 23 years today, but if anything, time has only increased the incredible amount of respect Senna gets from racing fans. Senna passed away at the top of his driving career, leaving fans to wonder how far his career would have gone if he had escaped injury and death. 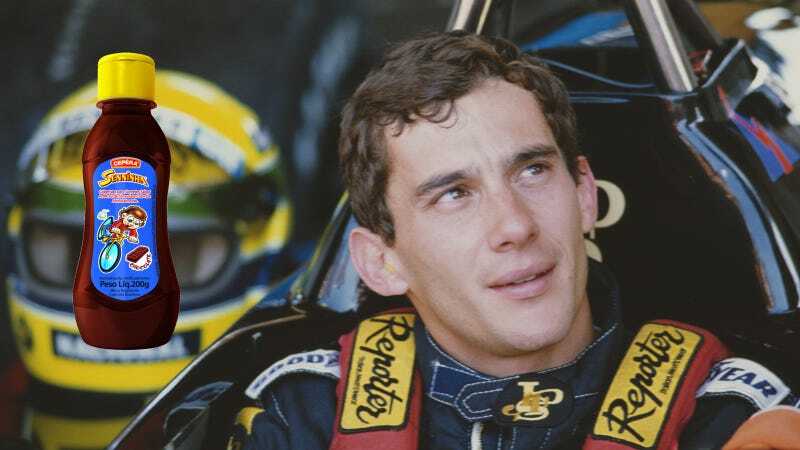 The BBC reports funds raised by selling the right to use Senna’s name and image go back to the the Ayrton Senna Foundation, which was founded by Ayrton’s sister Viviane several months after Ayrton’s death to benefit Brazilian children. [The foundation] caters for two groups of consumers. The first are Formula 1 fans who buy products such as books, DVDs, helmets and collectible souvenirs. And then there are products for the general public who may not necessarily enjoy racing, but like Senna for his charisma and values. These include toys and comic books for children and a food line of ketchup, mustard and mayonnaise. In the past five years, the Ayrton Senna Foundation has raised $320 million from the use of Senna’s name in various products alone, according to the BBC. The funds have helped nearly two million Brazilian children since the foundation’s beginnings. The Ayrton Senna Institute is not without its critics, however; teachers’ unions say that the foundation (which also trains 60,000 teachers per year as part of its work) doesn’t place enough value on emotional skills, that “the foundation sees schools and teachers too much as enterprises,” the BBC says. Either way, it’s incredible to see how much respect Senna still gets over two decades after his death, not to mention the odd ways that admiration still gets channeled into Senna-branded chocolate sauce, airplanes and other things. Can we get some of this stuff in America? You know, for charity.